QUICK & EASY HR SERVICES FOR ALL. Acuity partners with customers and ServiceNow to scope, right-fit, analyze needs, implement, optimize and support ServiceNow HR Service Delivery suite of applications. ServiceNow’s HR Service Delivery applications help companies streamline and standardize documentation, increase efficiencies in interaction and fulfillment of employee inquiries and requests by providing a single place for employees to quickly and easily get all the HR services they need with Case and Knowledge Management and Employee Service Center. 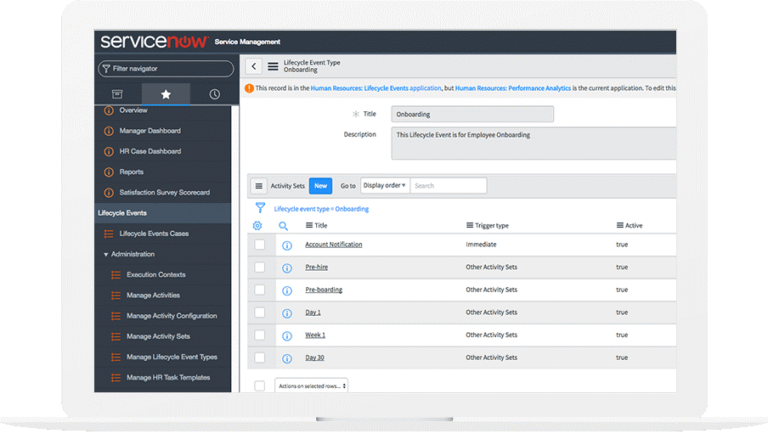 ServiceNow Enterprise Onboarding and Transitions automates onboarding and other employee lifecycle events that span multiple departments. By allowing you to facilitate processes like onboarding, offboarding, relocation, leaves of absence, IT processes, facilities, finance and legal processes, you will be able to drastically improve efficiency and provide fast, superior service to employees. Interested in learning more about ServiceNow?